South Africa - Broadcasting from Johannesburg, SkyRoomLive.com distributes live music concerts both within South Africa and internationally via internet streaming — and since its inception has rocketed to ninth most popular live-streaming internet portal on Irocke (the most comprehensive source for live streaming concerts on the globe). The SkyRoomLive.com Jozi Digital Music Festival, which runs across six consecutive days from 29th November sees many of South Africa’s top artists performing live to the world via internet streaming. Prosound South Africa was named official audio partner for SkyRoomLive and now this festival was lit by Prosound partner, PR Lighting for the first time. “We are proud to have PR Lighting join such a high profile event alongside our other top brands such as Electro-Voice, MIDAS, Audio-Technica and TC Electronic,” says Prosound Lighting MD, Ian Blair. PR Lighting has provided four of its latest XLED 1037 fixtures, along with four XLED 336 fixtures and four XR-200 beams for the event. Earlier this year SkyRoomLive.com partnered with SABC 1 to launch the first ever live-streamed music concert on South African television. The show has now been promoted to take over from popular South African music quiz-show Noot vir Noot which claimed 14 million viewers per episode. “This is a massive achievement for us over and above our ongoing broadcast of SkyRoomLive.com on SABC1. A big thank you to Prosound and PR Lighting for coming on board!” says Eban Olivier, SkyRoomLive.com. 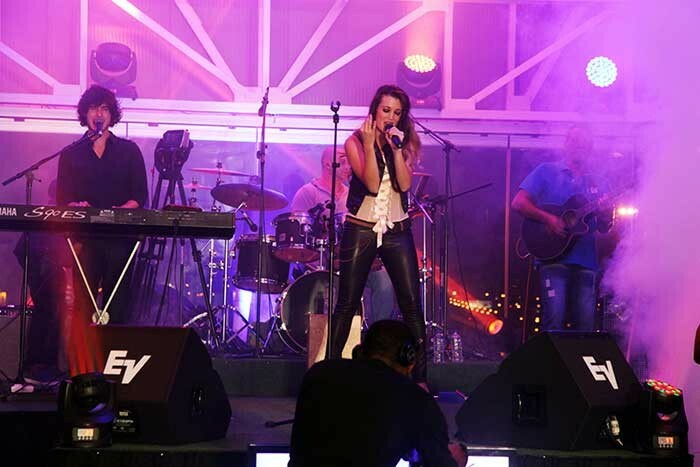 SkyRoomLive.com continues to build its reputation as one of South Africa’s top live-streaming solutions and with good quality sound and lighting from Prosound will continue to rack up the views. In picture: Nadine performing at SkyRoomLive.